I cannot believe we can count down the HOURS to the My Time Made Easy ™ LLC Release! Its been a great set of peeks so far, and today is NO different. This was the sample used in that post. Now in that post I stated that both pieces to this template are able to be used on their OWN! This gift package is a “get well” themed idea I had using *only* the base for the Slip Cover ©! As stated before, while this is the PERFECT card box, it really can be used for so much more (as can ALL my templates!). There are no limits to your own creative liberty! You can put cocoa, coffee, tea, Biscotti, Cup O’Soup packets, tissues, cough drops, or whatever else you want to dream up! I mentioned in another post that both pieces are so pretty, they can act as separate templates, so here is my example! I simply printed the Pretty Printables © Fresh Flowers © digital paper (in the pink) onto my textured Blushing cardstock. It made for a STUNNING design. Then (before I had it cut out) I printed my Blushing dots from the Lovely Dots © collection on the other side! Now both sides of my template look amazing (inside & out). It is little details like that, that usually make a world of difference! Don’t you LOVE that tea pot? OH! I so love it. I stamped it in a berry ink, and added my little flourish from the So Sentimental Set. This made a decorative tea pot in seconds!! I cut it out and layered it onto my tag. NOTE: For the handle, use a HOLE punch in there! Easy Peasy!!! Now for the tag, I used the Tag You’re It © cut file (shrunken to about 1.5 inches wide). I layered that with the Blushing tag, and a scrap piece of that same Fresh Flowers © patterned paper only printed on white(from another project). I stamped the sentiment in a berry ink. 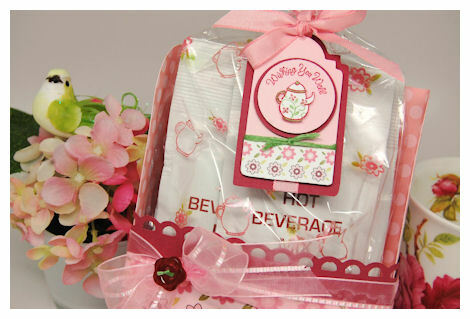 Don’t worry, there is a “time for tea” sentiment too (you will see that soon enough!). I hope you can see the details on there! Notice that open scallop border? That is one of our NEW! Open Scallop Border Builder Cut Files!!! There are 6 various borders this month! Now you can make these pretty strips for ANY project! Make it as long or as wide as you like, perfect every-time. Now for the tag at the bottom…. I really wanted to add this larger sentiment to the box! So I stamped it first, onto my cardstock, then just used a Stampin Up! Oval punch. Well thanks for hanging in with me here! Now you you have to come back tomorrow since it is our RELEASE DAY! It is also the day of our first group post. We have a LOT to share using the NEW! stamp sets, so stay tuned! I need to post the winner of the GIVEAWAY —> from here! I will be emailing you with details tomorrow. Be right back with the next peek bedfore the release!